As kids growing up in Derby, Maine, and just an hour drive from Bangor, taking a rare trip to the big city of Bangor was unusally exciting. 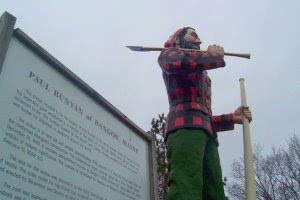 There were no statues in my small town, so getting to see the giant statue of Paul Bunyon shown here was a thrill. Other attractions like the community pool with diving board remind me of Jethro from Beverly Hillbillies calling ‘em cement ponds. I remember the first McDonald’s hamburger joint on the outskirts of Bangor when it first opened in the 1960’s, and the delight of 25 cent burgers with fries and great chocolate shakes. 45 years later those 75 cent meals are partly to blame for that extra 75 pounds I weigh now. The golden arches and X number of millions of hamburgers served were unique and iconic. Who would have known those Ronald McDonald toys would fetch a small fortune on eBay nowadays? Looking back, and having traveled the world to view even more exotic sites from Europe, Africa, and Asia, the simple pleasures of living in a small town and spending summers like Huck Finn or Tom Sawyer still own my heart and memory. The Maine slogan “Vacationland” giving way to “The Way Life Should Be” seems even more appropriate.